The great example of rehabilitation, reuse, and renaissance of an area in Sant Andreu is the industrial site of Fabra i Coats. Important factory of the industrial revolution fell into the deterioration and abandonment before resurface as a centre of artistic creation. Similarly Street Parellada always lived as a secondary street for entry and exit of goods from the warehouses of the industrial group, always hiding in the town of Sant Andreu. 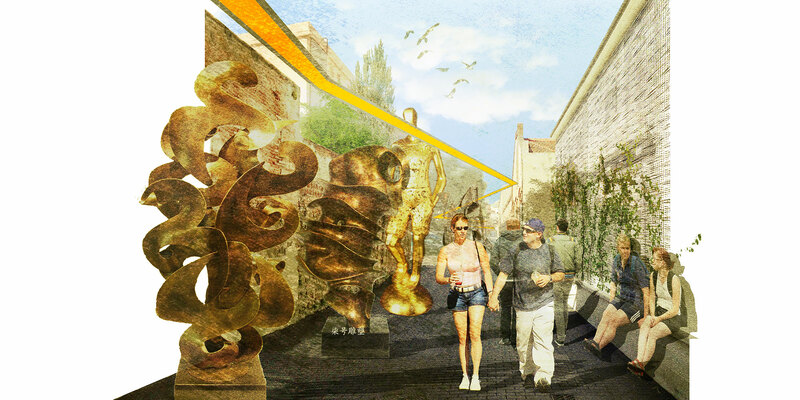 The aim of the proposal is to open this street not only to the town citizens, also to the foreigners. An open art space that allows exhibitions and promote the creations arising from Fabra i Coats and simultaneously a rest area with peaceful garden that remains separated from the bustle circulatory Sant Andreu. The continuous light trace captures the pedestrians and guides them through walls and screens for the exhibitions, as well as to green spaces to stay.